An English man is the world's best "Santa" after winning the Father Christmas Championships in Sweden. 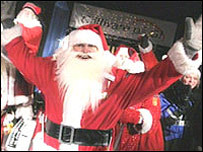 Ron Horniblew, whose grotto is in Luton Arndale Centre, took on 50 contenders to win the title in Gallivare. He impressed the jury with his taming of obstinate reindeer, present wrapping and sleigh driving. The 69-year-old, who works as an upholsterer when not Father Christmas, said: "It means happiness - that is what being Santa Claus is all about." Ron beat competitors from Russia, Estonia, Spain, France, Denmark, Finland and Sweden. All participants had to prove they were jolly and generous - as well as abseiling down a narrow chimney. Ron said: "It's the first time I've taken part in the Winter Games and I certainly didn't expect to win, not against some of the veterans from Denmark and Sweden. His wife Betty said: "To him it was like winning gold at the Olympics." The real Father Christmas was too busy to take part in the championship.